ALL GONE! Spyderco Knife Rights 2018 Limited Edition "SpydieWeb" Native5 Lightweight Folder: $145 Retail Value Without Engraving - FREE* to $300 Donors - ALL GONE! This Knife Rights 2018 Limited Edition Spyderco SpydieWeb Native5 Lightweight features unique laser engraved spider webs as backgrounds on front and back with the Knife Rights Sharper Future™ logo on the front and our popular "All Knives Matter!®" trademark on the back. 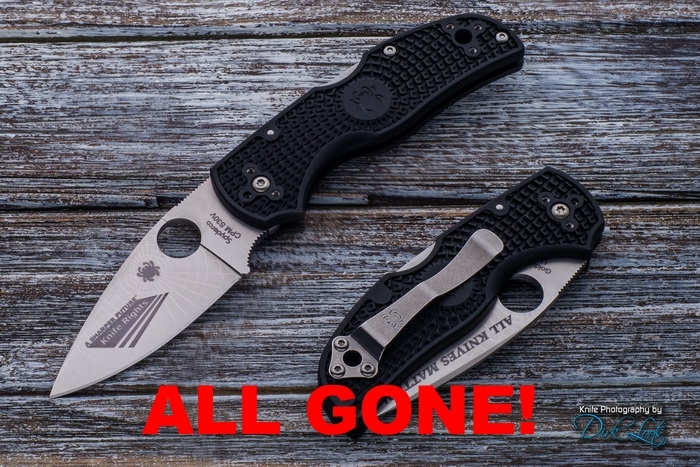 Generously donated by Spyderco - Retail Value without engraving: $145 - ALL GONE!